The Highway 15 is a brute in a small package. Built with the same heavy duty internal components as those used in our Highway 22 panel, it can easily handle the basic power requirements of any vehicle. Its size makes it the perfect power center for roadsters, T- buckets, kit cars, race cars or any other vehicle where basic operational circuits are required. Heavy gauge lead wires are provided for battery, ignition, accessory, horn, turn signal flasher, and 4-way hazard flasher. Best of all, it is also designed around the same step-by-step installation approach employed with all of our systems. Easy clamp-style system makes adding and removing wires easy! No Terminals! No Crimping! No Screws! Ignition switch Included. Connections included for either dash or column mounted ignition switches. All needed terminals and connectors to finish the basic wiring system are included. Complete wiring for headlights. (Headlight switch included with internal circuit breaker.) Mounting legs are moveable to allow for various mounting situations. Alternator regulator diode included. Micro-Relays for Horn and signals. 15 output connections! Floor mounted dimmer switch Included! 3 position head-light switch! Heat Resistant Nylon 6/6 Construction Throughout! Designed with internal circuit breaker protection (Billet knob included). Unique design of “gauge cluster disconnect ” makes connecting up to 8 gauges simple and convenient. Heavy 8-Gauge alternator power feed wire! High heat and abrasion resistant XLPE wire. Wire withstands -60°F to +275°F! 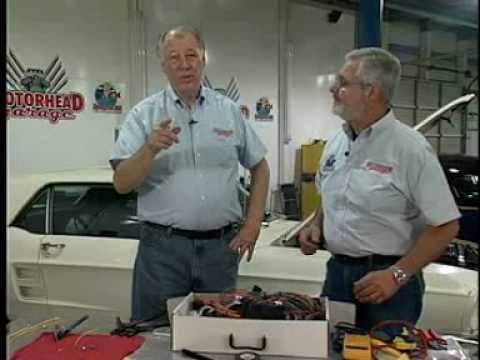 Complete engine compartment wiring for oil pressure, water temperature, starter, neutral safety switch, ignition switch, distributor coil, main power feed, alternator and regulator. Coil leads supplied with connector for GM HEI distributor. Bypass wire included for point type distributors. Headlight circuit complete with circuit breaker for headlight switches without integral circuit breaker. Dash wiring included for electric gauges such as oil pressure, water temp., voltmeter, fuel gauge, and tachometer. Dash lighting for all gauges, speedometer, turn signal & high beam indicator lights. Complete wiring for steering column including horn, directional signal switch and 4-way hazard switch. Standard 3-7/8″ GM column connector (both male and female) are provided to directly plug-in to any ’69 -’74 GM steering columns. Connector bodies and terminals are pro- vided to also make mating to any make column a breeze! Complete wiring for radio, heat and A/C, and wipers. All fuses, flashers, and relays included. Standard turn signal and hazard flasher circuits. Circuit breaker capability on 1 battery and 1 accessory circuit. Wire circuit ink-jet labeling every 2″ or 3″. Heavy duty terminals and internal power buss. Rugged factory terminals and terminations within the fuse panel assembly.